Hottman stands atop podium at Sunflower State Games Age State Championship! Donavon Hottman, Fred Thompson, Frank Quinlan, and Bill Wells had their sights set on earning a gold medal at the 2015 Sunflower State Games Age State Championship in the Masters 65+ category on July 19, not letting the likelihood of rain deter them from their goal. The course is a 29-mile loop in southeastern Shawnee county. The race started with a 3.5-mile neutral roll out. As the race progressed, the racers encountered light rain and a 2-mile section of road with new chip seal applied. Attacks occurred throughout the race, but nothing got away until a final punchy hill just before a right turn to the finishing line straight. The pack was strung out after that final climb, and Hottman and Wells were able to gut it out to the finish line, earning gold and bronze in their category, respectively. Hottman and Wells enjoying the scenery from an elevated position. Quinlan has attended and completed every single KBAR race so far this year, a testament to his durability and competitive nature. 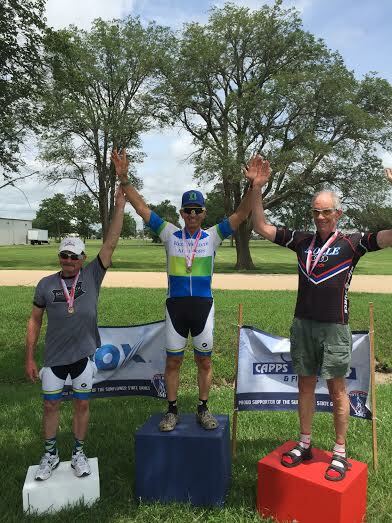 Greg Vaught came unclipped in the final sprint to the line, but was able to slyly glide across the line for a bronze medal in his Masters 50+ Category. 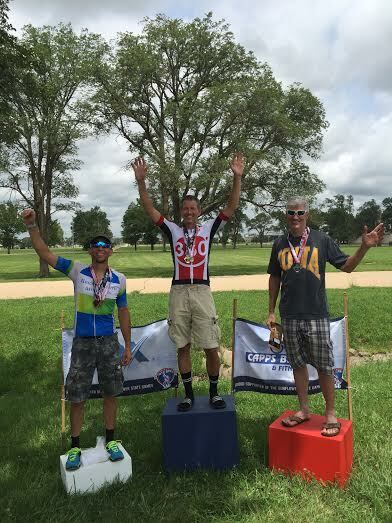 Jay Raupp earned yet another podium in his Masters 60+ category. Vaught still working hard to get that view above Steve Songer. Joe Kleidosty was a little out of position and did not respond to the final sprint quickly enough, but he able to still get silver in his Masters 40+ category. What is Kleidosty doing with his right hand? Podiums galore for our Big D Cycling team, sponsored by Keen Wealth Advisors! 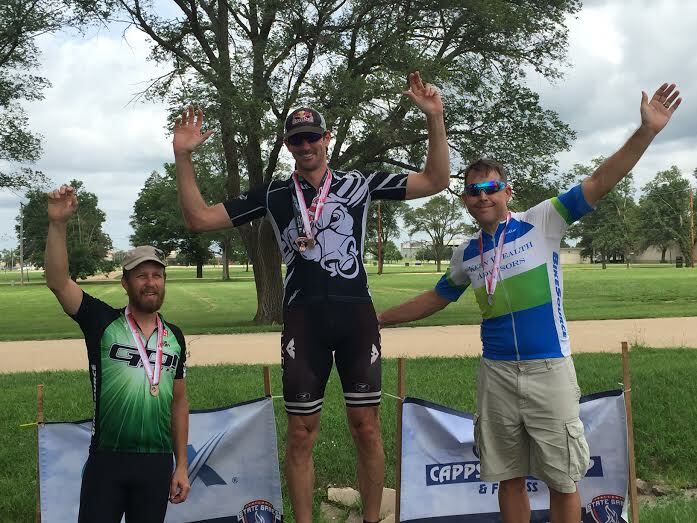 Previous PostJay Raupp Takes in Good Views Atop Podiums at Tour of LawrenceNext PostKleidosty Switches Gears to Participate in the 2015 Kansas State Category Road Race Championship!